These FOs were done ages ago, but I kept wanting to take better pictures, or do separate posts, because they are fun projects that deserve more than just a gloss over, which, for lack of time and will, is what I'm doing. Remember this? This is a very well written pattern (four pages for a hat!) 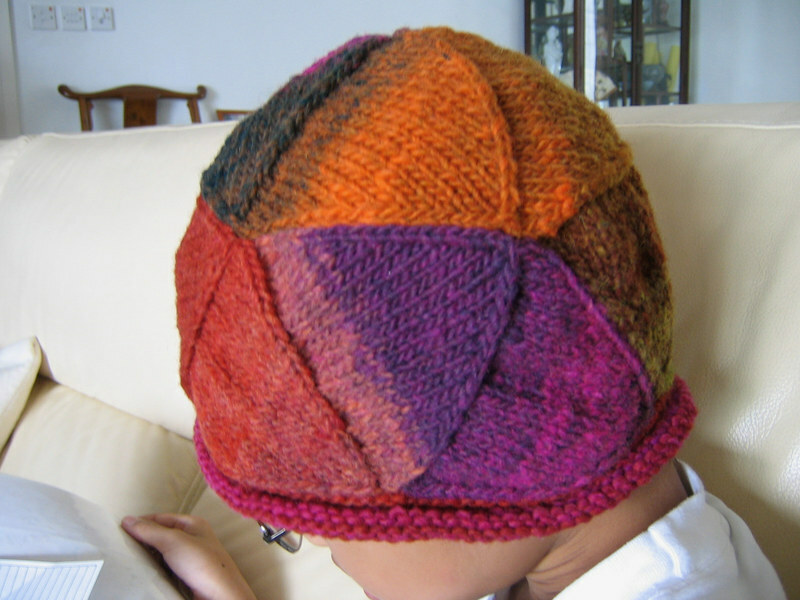 which explains its construction by knitting a strip of connecting triangles how the size of the hat can be adjusted with a lining, and includes variations for the brim. 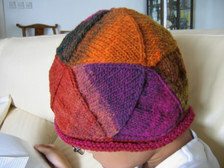 I chose not to do a lining, so the hat is on the large side, but I admire it for it's clever use of the yarn's changing colors. 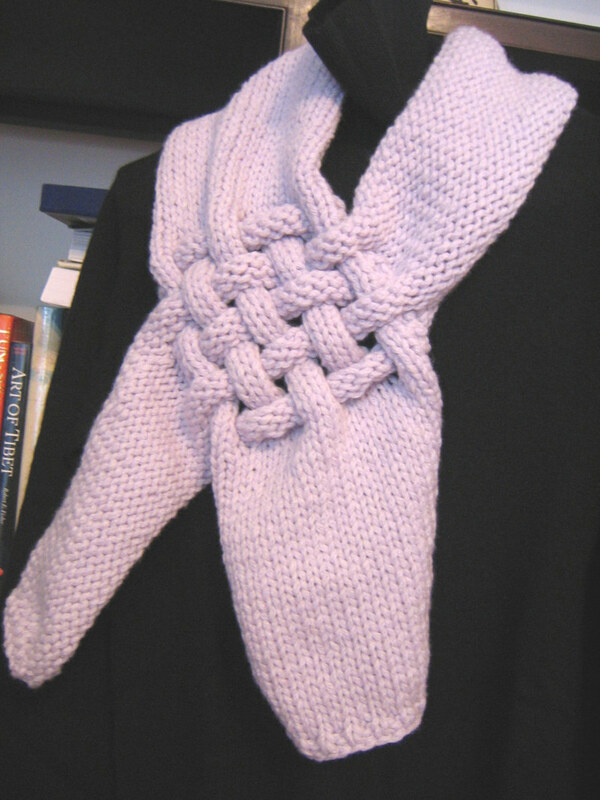 I would knit this again, though with smaller triangles. I really like these, though they're not for the coiffure conscious because it goes over the head. Easy to knit, light (about 100g each) and warm (though not around the neck), hehe, I'm keeping one for myself. Want to see it before braiding? I adjusted the two-toned scarf 20% narrower to compensate for having one less ball of yarn than the blue one, which used up all of the five balls. The recipient's feet are smaller than mine so her toes won't be poking out like mine in the picture. 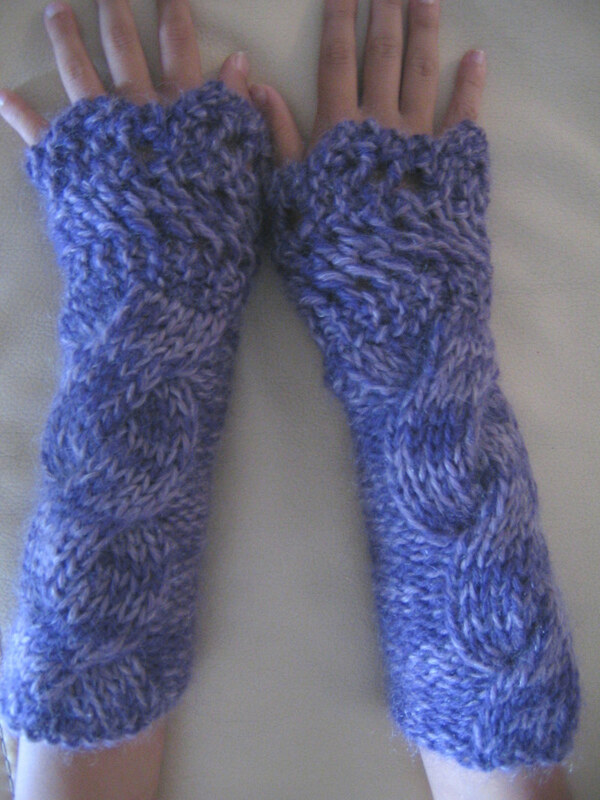 ;-) Knitting Yorkshire DK with 3mm needles hurts the hands a bit but makes a nice and dense fabric for slippers. The yarn softened up enough after washing and blocking made seaming much easier (I tried seaming before blocking the pieces, which were rolled up like littles sausages). I had some medium sized suede soles but they were too big for these slippers. Maybe I'll send along some puffy fabric paint for a do-it-yourself sole. :-) I like how these turned out, and the rosy pink is my favorite color of Yorkshire tweed, but I don't want to make these again. They're too fiddly with three pieces for each slipper and it's not fun having to read the instructions just about every row because there's a lot of shaping. With Christmas looming ever so closely, the gifts that need to be sent overseas will be priority knitting. That means delaying Powder Puff, which I had started one night, in my dream. Talk about wanting it badly! Looks like you're stocking up for colder weather :-) Great stuff! Love them all, especially the slippers and great idea about the puffy fabric paint. I'm always concerned about slipping, I can fall over anything! Eowyn! 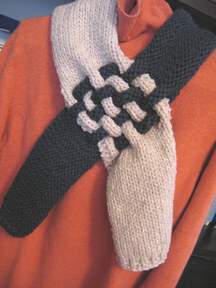 That's on my "knit soon" list! How long did that take you? So many lovely knits. 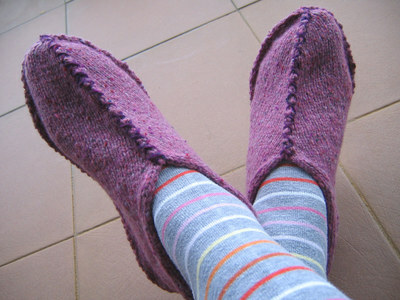 My fave is the slipper - you have cute socks. The 2 toned scarf is so striking too. Those slippers are wonderful! I know your friend will enjoy them - stylish and I bet very comfortable :). What fun stuff. That hat is so cool. The recipients are all very lucky! Wow, you have all covered from head to toe! Those are very unique designs and I like them all. Your friends will be delighted! I like the slippers best too although you didn't really enjoy the process. Talking about wanting something badly, I dreamt of rampaging through your stash, dyeing and etc the other night. 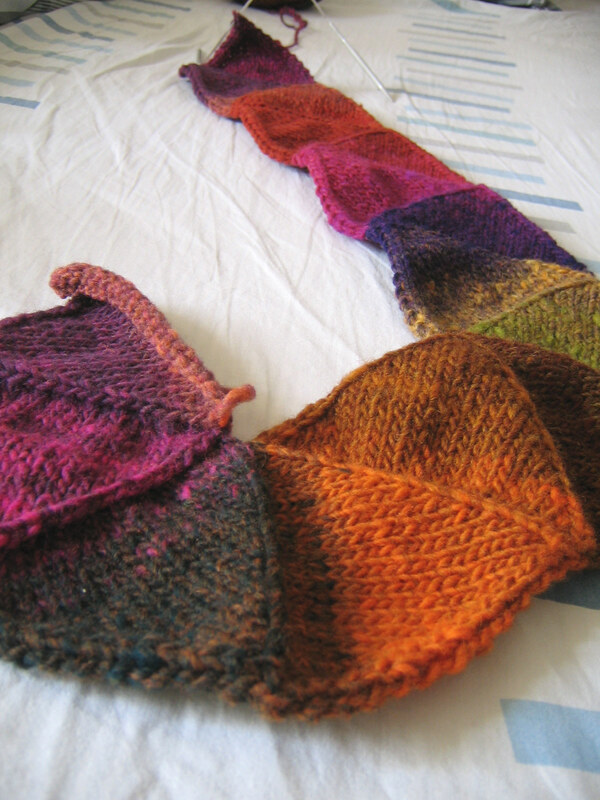 It was a good, knitterly dream, it goes to say how much I missed last Saturday's knit-out. Lovely stuff, especially the slippers are so nice! You've really been busy! Oh, I love them!! Especially Eowyn and the slippers, LOVE them! 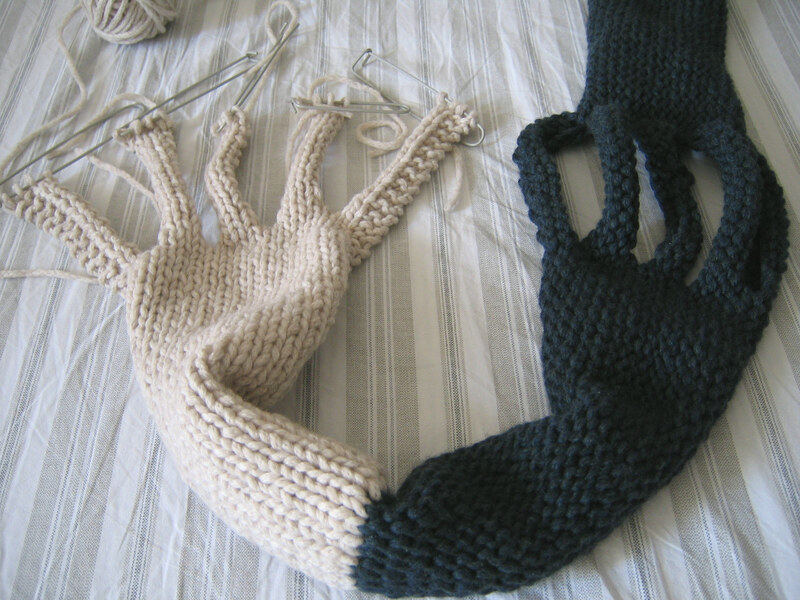 You've been knitting up a storm! 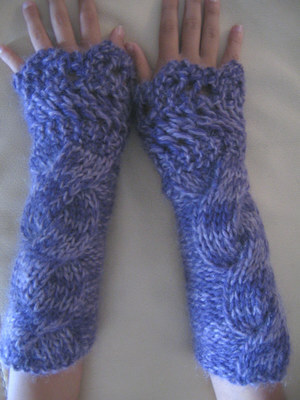 I love how your wrist warmers turned out. I have yarn waiting to make the Sally Dallas slippers and your finished pair have inspired me to get going.